In the tussle between the euro zone’s north and south, Erkki Liikanen may boast just the right credentials to become the next president of the European Central Bank. The former governor of Finland’s central bank is the new frontrunner in a Bloomberg survey of economists on who’ll succeed Mario Draghi in November 2019. His chief selling point, as the ECB prepares to unwind years of monetary stimulus, might be as a compromise candidate. The next president will need to balance the demands of nations such as Germany that want to end crisis-era stimulus as soon as possible, and those like Italy nervous that their economies will be crippled by a lack of monetary support. Marathon runner and cross-country skier Liikanen could be the person to go the distance. Liikanen, who said this year that he’d consider doing his “duty” if asked, has seen his chances boosted after reports that Germany will seek a senior European political post instead of pushing Bundesbank President Jens Weidmann for the top ECB job. He’s been in a similar position before when his name was floated as an option to head the ECB in 2011 after Germany’s Axel Weber withdrew from consideration. If Liikanen gets the job, he’d be 69 when he starts, older than any of the previous three presidents. 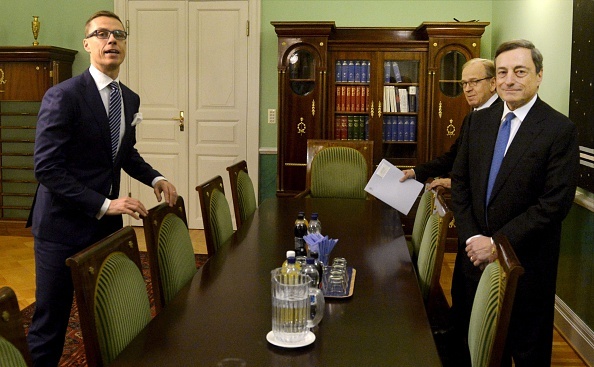 He’d also bring almost half a century of experience in a career that took him from Finnish politics to the European corridors of power in Brussels and onto the Finnish central bank. The latter post gave him a seat on the ECB’s Governing Council from 2004 until his term ended in July this year. He has a reputation for being tireless. He’s active on social media with frequent book reviews, current-affairs commentaries, and anecdotes. In one Facebook post, he said two French tourists this year mistook him for a guide when he walked them through an art exhibition at the central bank. He also posts pictures from his fishing expeditions for vendace and perch, which he smokes at his lakeside cottage in Anttola, 158 miles northeast of Helsinki. Earlier this year he competed in a 20-kilometer (12 miles) cross-country ski race with former Federal Reserve Governor Randall Kroszner. Liikanen’s career began in 1972, when at 21 he became the youngest Finn ever elected to parliament. As finance minister from 1987-1990, he oversaw an economic boom before leaving for an ambassadorship in Brussels as growth slumped, and served two terms with the European Commission. In 2012, he led a panel of experts that recommended tougher capital requirements and separation of proprietary trading to strengthen European banks. He’s been a stolid supporter of ECB decisions under Draghi, and earlier this year cautioned against tightening monetary policy too soon. He declined to comment for this article.